Does Garlic in Abundance Damage the Eyesight? Overdosing on garlic can cause more than a distinctive and pungent odor. While garlic has a number of potential health benefits, too much garlic can interfere with blood clotting, reports a 2007 study published in "Molecular Nutrition and Food Research." 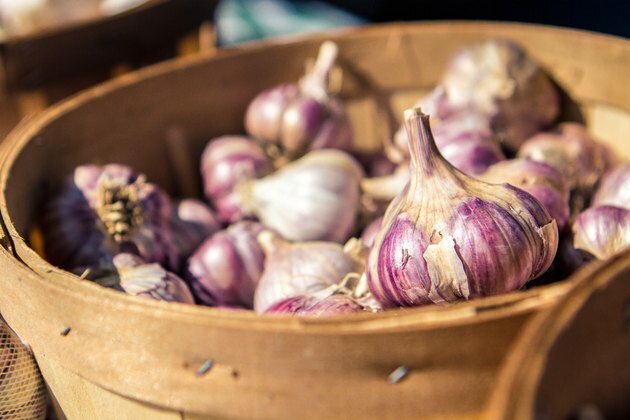 If you already take a prescription blood thinner such as warfarin, garlic can intensify the effects and increase the possibility of excessive bleeding. Large amounts of garlic could cause or worsen bleeding in the eye, leading to vision loss, in some cases. Ask your doctor before taking garlic supplements. Garlic can interfere with the ability of platelets, small fragments that congregate at the site of injury in the blood vessels, to stick together. Drugs that have this effect often are called blood thinners, although garlic doesn't thin blood but rather acts as an anticoagulant. Anticoagulants prevent blood from clotting, which can lead to excessive bleeding that can occur spontaneously or after injury. Hyphema refers to bleeding inside the anterior chamber of your eye, which includes the space between the iris -- the colored part of the eye -- and the cornea -- the thin, domed-shaped tissue that covers the front part of the eye. Hyphema can develop if you have trauma to the eye, such as a blow. Cancers of the eye or eye infections also can cause hyphema. Taking large doses of anticoagulants such as garlic can cause hyphema or worsen hyphema that has other causes. Because your blood doesn't clot properly, bleeding into the anterior chamber continues. Hyphema can cause vision loss, which could become permanent. Many people take prescription anticoagulants to prevent stroke or heart disease. Two disorders, diabetic retinopathy and macular degeneration, commonly cause bleeding within the eye because of the formation of abnormal blood vessels. Taking blood-thinning medications may not increase vision loss if you have these conditions, notes Dr. Randall Wong, an ophthalmologist and retinal specialist from Virginia. Diabetic retinopathy and macular degeneration both cause leaking blood vessels in the retina, the light-sensitive layer of cells at the back part of the eye. Bleeding also can occur in the vitreous, the fluid-filled central portion of the eye. This blocks light from entering the eye, causing temporary but usually reversible vision loss. Ask your eye doctor if it's safe to take garlic -- an over-the-counter supplement rather than a prescription drug -- if you have diabetic retinophathy or macular degeneration. Not all bleeding in the eye causes vision loss. Subconjunctival hemorrhage, for example, causes the sclera, the white part of the eye, to turn bright red; this looks horrible but normally doesn't affect vision, according to All About Vision. Taking anticoagulants such as garlic can cause or worsen subconjunctival hemorrhage, which occurs when blood vessels in the conjunctiva break, but this condition normally clears up within seven to 10 days without any vision loss.